For Inkosi (Prince) Mntwana Ngamizizwe Madlala his son’s graduation meant a trip down memory lane to his own stay at MUT when he was still a student. His son graduated with a Diploma in Electrical Engineering this morning (Wednesday, 10 April 2019). 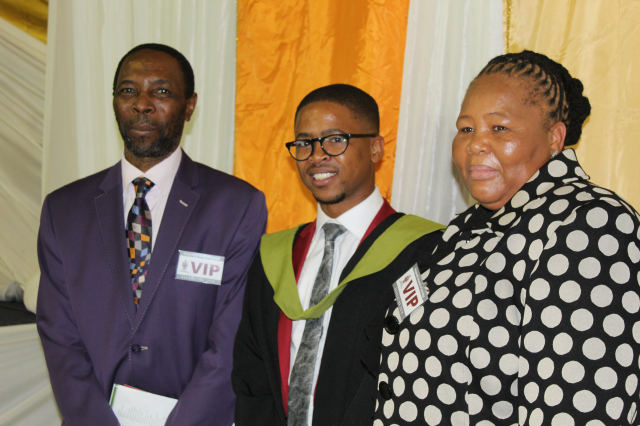 Inkosi Madlala and his wife, Ndunkulu Nkanyiso Madlala were at one of the five MUT graduation ceremonies to witness their son Mthokozisi Lungelo Freedom Kukhanyakwezwe Madlala going through the illustrious rite of passage as he was becoming an MUT graduate. Inkosi Madlala’s Traditional Council is under Ray Nkonyeni Municipality, in the Ugu Municipality in the south of the KwaZulu-Natal Province. Inkosi Madlala became chief in 1994 after the passing away of his father. However, Inkosi Madlala had long been acting on his father’s behalf as his father was already too old. His father was more than 100 years old when he passed away. Inkosi Madlala is a direct descendent of the Zulu Royal House. He can recite the history of the Zulu nation, going back to its foundations. He is very proud of his royal lineage. But the Prince does not lead with this fact, lest it put him above all others. The humble Inkosi Madlala visited MUT at the time when the University celebrates 40 years of existence, and on the year in which the University graduates more than 2000 students. “Among them are six students with disabilities whose graduation is a testament that where there is will there is a way,” said Prof Marcus Ramogale, the Acting Vice-Chancellor. Also to graduate during the 2019 graduation season will be a 64 year old Sizakele Silungile Ngcobo, Sizakele graduates with a Diploma in Office Management and Technology. “We thank Mrs Ngcobo for reminding us that anyone who keeps learning becomes young,” said Prof Ramogale. Prof Ramogale also told the full house that MUT was graduating a record number of SRC leaders.